130 to blend more easily in to the room. The improved look is enhanced by a new, luxurious high-polish polyester finish, which is available in black or white. The key to the outstanding performance delivered by the HRS-130 is its carbon fibre DDD driver. This is an omnidirectional driver, which on the HRS-130 covers the range from 220Hz to 24kHz. 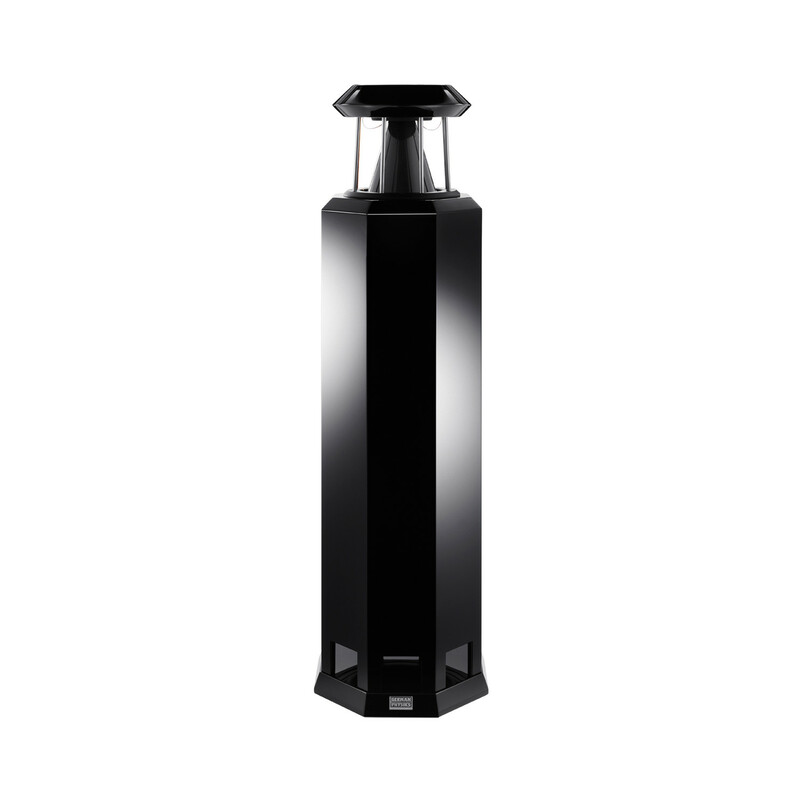 This extremely wide range is achieved by the use of pistonic, bending wave and modal radiation: most loudspeakers use drivers that are purely pistonic. The same quality of DDD driver is used on all German Physiks loudspeakers, from our entry level Unlimited Mk II, to our top of the range Gaudi Mk II. The DDD driver gives the same very important advantages to all German Physiks designs and is what sets them apart from the competition. 1. Exceptionally coherent and natural sound: The extremely wide operating range of the HRS-130’s DDD driver provides an exceptionally coherent and natural sound. This is very difficult to achieve when this frequency range is split over two or more different types of driver. This wide operating range also eliminates the crossover point in the mid-range that loudspeakers using conventional pistonic drivers must have. Our hearing is most sensitive in the mid-range and avoiding the level and phase errors that crossovers can create from this region further improves transparency. 2. Realistic stereo images more like you experience in the concert hall: When you listen to music in a concert hall, you are in an enveloping sound field where a lot of the sound is reflected off a surface before it reaches your ears. These reflections play an important part in the creation the stereo image that you perceive. 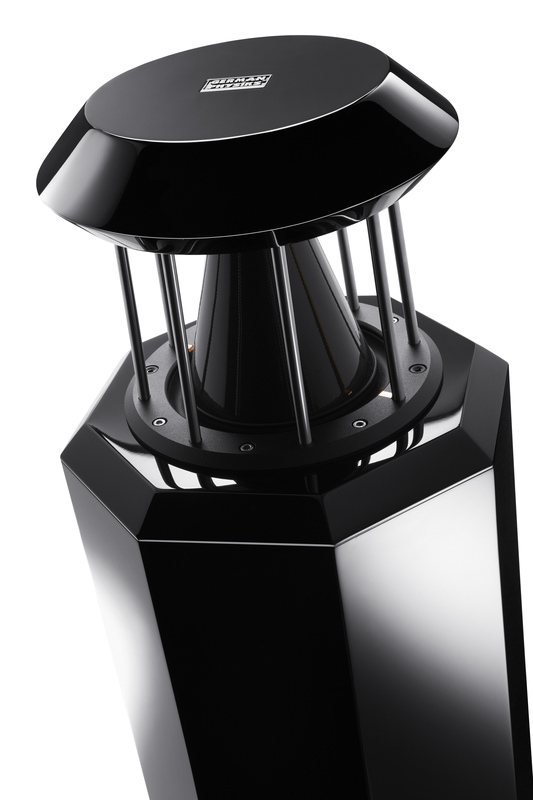 Because the DDD driver is omnidirectional, it radiates all frequencies evenly around it and so creates a similar enveloping sound field in the listener’s room. This way the HRS-130 is able to recreate a more natural rendition of the original stereo image. This has excellent depth and focus, but without the overly sharp image definition that some hi-fi loudspeakers produce and which you will rarely if ever hear at a live performance. 3. Stereo imaging enjoyable in almost all positions in the room: Conventional loudspeakers tend to produce stereo images that can only be best enjoyed from one position in the room, the “sweet-spot”, and then usually by only one person. Move away from the “sweet-spot” and both the stereo image and tonal balance become progressively degraded. This is because pistonic drivers tend to concentrate their radiation into a beam that narrows with increasing frequency. By contrast, the DDD driver’s omnidirectional radiation pattern enables HRS-130 to produce excellent stereo images that can be enjoyed from a wide range of listening positions in the room, whilst also maintaining a more even tonal balance: much like you would experience at a live performance. This gives more flexibility in where you sit and allows several people to enjoy a good sound simultaneously, so you can share your music with others. Because you are not restricted to a small “sweet-spot” in order to hear the best sound, the HRS-130 provides a more relaxed listening experience. This is especially noticeable when you listen for long periods. 4. Exceptional dynamics: The DDD driver’s very low moving mass provides an excellent impulse response, allowing it to recreate both the attack of the music and resolve low level detail very accurately. This is essential in order to faithfully reproduce the delicate nuances of a performance and make it sound like music, rather than just good hi-fi. The resultant transparency is maintained even on complex high-level passages. 5. Accurate portrayal of musical instruments’ tonal characteristics: The DDD driver is phase linear across its operating range, ensuring that the tonal character of each musical instrument is reproduced with great accuracy. This together with the excellent dynamic response enables the HRS-130 to reproduce percussion with startling reality. Voices are also exceptionally realistically portrayed, with all the elements that comprise the vocal sound correctly located in space and with no undue emphasis. You get a greater sense of hearing a live musician rather than a recorded one. The standard finish for the HRS-130 is high-polish polyester in black or white. It is also available in satin veneer, satin paint, high-polish veneer and carbon fibre finishes to special order. Please see the Finishes page on this web site for more details. To provide the ultimate level of quality, all our cabinets are carefully finished by hand.